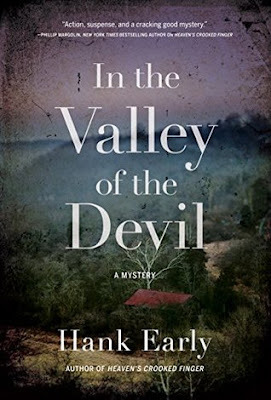 Private investigator Earl Marcus is at war with the white supremacists infesting his rural Georgia town. With the assistance of his blind best friend, an angelically patient library director, a man he'd rather have nothing to do with, a girl whose brother has also disappeared, and a raft of other allies, he races against the clock to save his girlfriend, a black homicide cop who went missing in a spooky cornfield — allegedly captured by Old Nathaniel, the devilish mythical figure that haunts the valley. Earl, still reeling from his traumatic relationship with his fire-and-brimstone preacher father and disturbed by his latest prophetic dream, battles both powerful enemies and a shadowy bogeyman. While the basic message it champions (racism = bad) can only be praised, sadly this book tests the tensile strength of its readers' credulity to such an extent that the facepalms detract from any good intentions it may have. Earl's escapades as he runs from point A to point B to point C with little apparent rhyme or reason, liberally distributing punches, pointing his gun with predictable regularity, getting knocked around, then setting off again on his wild pursuit, left me thoroughly exhausted and bewildered. What saves this novel, in my opinion, is the weaving of local folklore and criminal history into Old Nathaniel as an instrument of racist violence. If you're looking for a novel featuring an impressively lucky yet spectacularly unlucky character with poor impulse control, frequent memory lapses, quasi-superhuman resistance to pain, and chronic phone charging issues, this comedy of errors is for you. I was provided with a free electronic copy of this book through NetGalley by the publisher, Crooked Lane Books, in exchange for an honest review.